We're Throwing An End Of Summer Party! Maryland independent record label HighVolMusic is throwing a Rock n' Roll party on August 25th at Fiore's Concert Pavilion in Wooster, Ohio. 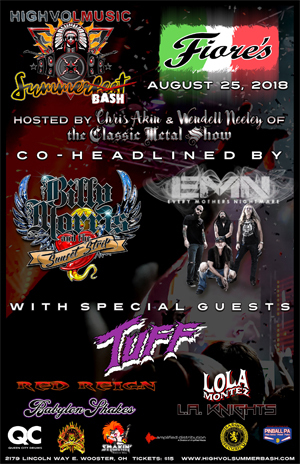 Dubbed HighVolSummerBash, the event features label artists and co-headliners, BILLY MORRIS AND THE SUNSET STRIP, EVERY MOTHER'S NIGHTMARE and BABYLON SHAKES. Also appearing on the bill are TUFF, RED REIGN, LOLA MONTEZ, and L.A. KNIGHTS. The event is being hosted by The Classic Metal Show's Chris Akin and Wendell Neely. Cleveland's own rock hero Billy Morris, is releasing his debut CD, Holdin' All The Aces on August 24th. The event will also serve as the CD Release Party. The new CD will be on sale at the event. HighVolSummerBash is sponsored in part by Miller Lite, Fiore's Italion Restaurant, Smokin' Rock n' Roll Food Truck, Queen City Drums, Classic Metal Show, Pinball PA, Sarge Security, and Amplified Distribution. Anyone who has already purchased a general admission ticket and would like to upgrade to the Bonus Bash ticket please contact musichighvol@gmail.com for availability. The additional upgrade fee is $41 per ticket. Please note that there are only 50 tickets available for the Bonus Bash.